A lot of people assume that watermelon juice is simply water with a little flavor, but this sweet-tasting fruit has much more to offer in terms of health benefits. Who can resist a juicy slice of watermelon to beat the heat on a hot summer day? For many people, it is a guilt-free way to enjoy a dessert since watermelon is low in calories. United States Department of Agriculture (USDA) statistics show that Americans consume at least 4 billion pounds of watermelon every year. Studies, including those the USDA has been associated with, have shown that consuming fruits and vegetables are a good way to reduce the risk of various lifestyle-related health problems. Studies that have been conducted across the globe suggest plant foods like watermelon have the potential to decrease the risk of obesity, diabetes, heart disease, as well as increase our energy and improve our complexion. The health benefits of watermelon juice do come from the fact that the fruit is a great way to keep hydrated, especially during the hot months. Sometimes, it can be difficult to get young children to drink enough water, but it is easier to get them to consume watermelon. However, the benefits don’t end there. Watermelon is a good source of fiber, vitamins C, A, and B. It is also a source of protein and carbohydrates, as well as potassium, iron, calcium, magnesium, and phosphorous. Watermelon contains enzymes, organic acids, and natural sugars. It also has no fat or cholesterol, and limited sodium content. Blood pressure: The potassium and magnesium, along with the acids in the watermelon, combine to help keep blood vessels healthy and maintain smooth blood flow. The watermelon can also help maintain proper electrolyte and acid balance, which are all-important for a stable blood pressure level. A study published in the American Journal of Hypertension reports that watermelon has the ability to reduce blood pressure in those who are overweight. Asthma: Some research suggests that the risks of developing asthma are lower in people who consume higher amounts of certain nutrients, including vitamin C. As mentioned above, watermelon contains vitamin C. The British Medical Journal (BMJ) published a report in 2014 that suggested vitamin C should be included in a list of asthma treatments to be examined further. Heart health: Amino acids help maintain arteries and good blood flow, which promote healthy cardiovascular function. There are amino acids in watermelon. The fruit also contains beta-carotene, as well as vitamin C, known to help reduce cholesterol. 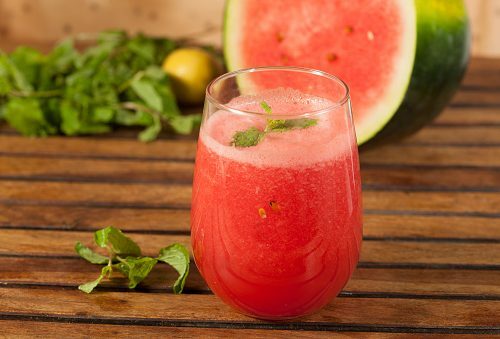 Weight loss: Research seems to suggest that watermelon juice benefits weight loss. In animal studies, acid, like that found in watermelon, appeared to interfere with the production of fat in fat cells. Since watermelon is low in calories and does not have any fat in it, many people have turned to it as a weight loss aid. The fact that watermelon contains about 90 percent water helps us fill up quickly and avoid over-eating. Skin: Hydration is important for our skin and since watermelon contains water many people are not surprised to hear there are watermelon juice benefits for skin. The vitamin A in the fruit also promotes body tissue growth such as skin and hair. Vitamin C helps maintain collagen, which provides structure to both our skin and hair. Pregnancy: There seem to be watermelon juice benefits during pregnancy. Many women have reported that consuming watermelon while pregnant eased their swelling, heartburn, and morning sickness. A study in the International Journal of Gynecology and Obstetrics indicates that essential nutrients found in watermelon reduce preeclampsia by as much as 50 percent. Since watermelon contains vitamins A, C, and B6, as well as potassium and magnesium, it can’t hurt to eat the fruit when pregnant. All of these vitamins can be important to the development of a baby’s brain, nervous and immune systems. Kidney health: Watermelon can be a diuretic. It can stimulate kidney function and reduce uric acid in the blood. Some believe that the watermelon also helps the liver process ammonia, which can lower stress on the kidney while getting rid of excess fluid. Cancer: Studies are ongoing, but we know some scientific experts suggest that nutrients found in watermelon could be helpful in reducing certain types of cancer. We also know that vitamins C and A (also found in watermelon) play a role in protecting cells from free radical damage. Some nutritionists recommend consuming watermelon daily and not just the flesh, but the rind as well. Eye health: It turns out that carrots aren’t the only good food for our eyes. Watermelon juice benefits our eye health as well. Watermelon is an excellent source of beta-carotene. It also has a combination of vitamin A, vitamin C, and other essential nutrients that can keep our eyes healthy. Rich in antioxidants: Many nutritionists will tell you that watermelon is packed with antioxidants that have the ability to help keep us healthy. Antioxidants protect us from free radicals that can cause inflammation and problems such as arthritis, asthma, stroke, cancer, and heart disease. Some experts suggest that in order to maximize the antioxidant benefits we should consume watermelon that is ripe and fresh. There are many healthy watermelon juice recipes you can work into your diet, but no matter what you decide on it is important to prepare properly. For example, if you are going to make watermelon juice, scrub the outside of the melon with a brush and apple cider vinegar to remove any sprays or waxes. To make juice, cut off a portion of the watermelon, chop it up – including the skin and rind since it is full of great nutrients – then feed the pieces into a juicer. Voila, you have fresh watermelon juice. It’s as simple as that. You can do all sorts of things with watermelon. You can put diced watermelon and some ice cubes in a blender for a cold, refreshing drink on a hot day. You can spike up a salad with chunks of watermelon and mint. Some people like to have a watermelon salad with fresh mozzarella on a bed of spinach leaves, drizzled with balsamic vinegar. You can usually store cut watermelon in the fridge for up to two days. If you like watermelon and want to add more to your diet, take some of the following into consideration…when you go to buy watermelon, thump it with your knuckles. If it sounds hollow, it will likely taste sweet. Nutritionists say the best watermelons look dark green and have a dull, rather than shiny, finish with a pale yellow underbelly. Also, if you are going to turn your watermelon into juice, you might be tempted to choose seedless watermelon at the market, but the food experts say watermelon with seeds holds more nutritional value, so taking the time to remove the seeds before juicing is worth it.